UPDATED: Sat., Nov. 10, 2018, 11:42 p.m.
MOSCOW, Idaho – A disappointing season crept closer to its conclusion for Idaho, which fell to Montana 46-27 Saturday in the Kibbie Dome. The loss in the final home game left the Vandals with a 4-6 record (3-5 in the Big Sky Conference). Three first-half touchdown passes from quarterback Dalton Sneed helped stake the Grizzlies (6-3, 4-3) to a 36-6 lead. 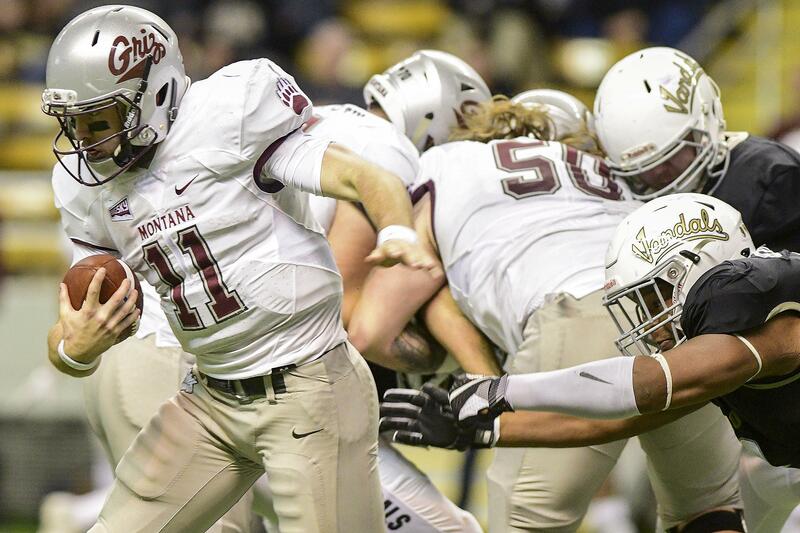 While Idaho chipped away in the second half, it could never seriously threaten Montana. A mostly undramatic final two quarters were played out before the remnant of a near-sellout crowd of 14,571. “That’s the best I’ve ever seen the dome. It’s the most full it’s ever been,” Vandals senior linebacker Ed Hall said. For a moment, a better fate for the Vandals hung in the balance. Idaho opened its second possession in the third quarter with Isaiah Saunders breaking two tackles, leaping over a third defender and racing 60 yards to the Montana 29-yard line. Eight plays later, quarterback Mason Petrino got to the corner and carried the final yard for a touchdown. Instead, the Vandals allowed Montana to drive 85 yards in 11 plays to make it 43-13. In his final home game, Saunders ran for 123 yards. Sneed completed 12 of 20 passes, without an interception, for 220 yards and his three touchdowns. He also rushed for 129 yards and the third-quarter touchdown that coach Petrino said ended Idaho’s comeback. “A couple of times we got good pressure on him, but he did a really good job of running,” Petrino said. Samuel Akem caught six passes for 130 yards and two of Sneed’s touchdowns. He had a long reception of 52 yards. Gabe Sulser made two catches for 65 yards. The first of those was a 59-yard strike from Sneed over the middle. Sulser outran Vandals safety Jalen Hoover and linebacker Charles Akanno to the end zone for Montana’s first score. It offset the 38-yard field goal Idaho’s Cade Coffey kicked in the first quarter to give the Vandals their only lead. He also said the Grizzlies largely limited Idaho’s ability to convert third downs, because they pressured Idaho’s quarterback with a three-man rush. Idaho made just 7 of 17 such conversions. “Where they kicked our butts was when they dropped eight and got a pass rush with three,” Paul Petrino said. Mason Petrino threw for 310 yards and two touchdowns. He completed 27 of 45 attempts. But the Grizzlies thwarted Idaho’s effort to answer Montana’s first touchdown. The Vandals mounted a brief but impressive drive that included a 10-yard pass to Cutrell Haywood and a pair of Saunders runs for 9 yards. But on second-and-5 at Idaho’s 44-yard line, with the Grizzlies playing a zone defense, linebacker Josh Sandry stepped in front of a Petrino pass and returned it 29 yards to the Idaho 27. Four plays later, Adam Eastwood scoredfrom 2 yards out, and the Vandals were down 14-3. Senior David Ungerer, as he has most of the year, led Idaho receivers. He had seven catches for 117 yards and accounted for Idaho’s final score, a 10-yard touchdown from Petrino on a slant pattern. Ungerer’s most impressive work, though, was done earlier. A pass over the middle, thrown a bit high, went through his hands on Idaho’s second possession. Ungerer and Mason Petrino went right back to the play, and on the next attempt Ungerer made a catch and took it 46 yards to the Montana 22. Coffey capped that drive with the first of his two field goals. “I thought David Ungerer played his heart out today,” Paul Petrino said. He also singled out senior linebacker Kaden Elliss, senior cornerback Dorian Clark and Hall. Published: Nov. 10, 2018, 8:16 p.m. Updated: Nov. 10, 2018, 11:42 p.m.